The ceremony is about to begin. The American Ambassador at the far end of the dais, followed by Antonia Abraham, the Minister of Plan and the Director General of the Parks Service, ICCN. Preparing the Abraham Ceremony this year was often too sad to bear. Last year we gave awards to the widows of eight park guards who died defending Congo’s parks; this year there were 10 deaths and it didn’t stop there. Rebels killed three more guards as we prepared the ceremony. Why in Virunga, the most exquisite and varied park in Africa? Why are there still gangs of rebels? When will this war end? 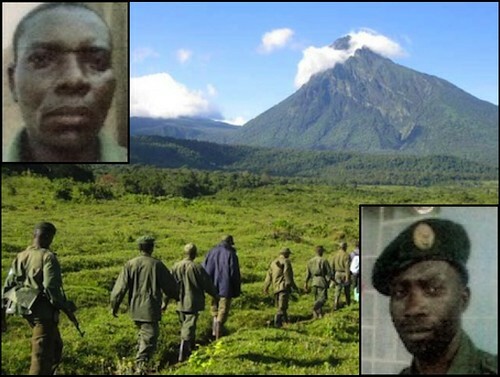 The park guards, Muhindo (above) and Mastaki (lower right), were killed in an attack by FDLR rebels in Virunga National Park on 31 January 2011. 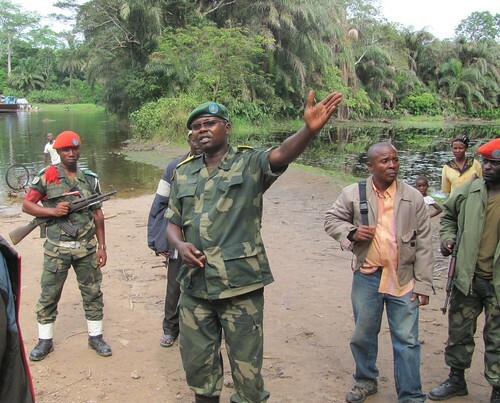 Even more incomprehensible: Two guards were ambushed and killed as they questioned elephant poachers in the Okapi Reserve; some of those poachers were Congolese military. Those military were never accused, never brought to justice. 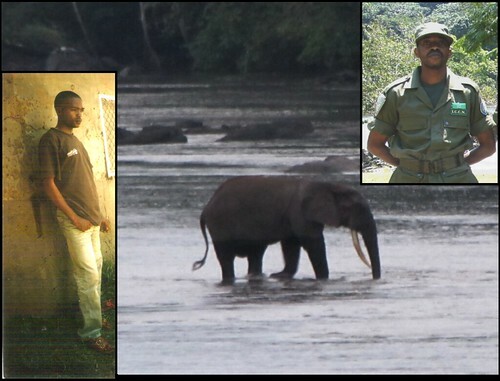 The park guards, Kambale (left) and James (above right), were killed by military poachers just before Christmas 2010. This is a double mourning. We are not only mourning the deaths, but also mourning the tragic failure of the rule of law. How much longer will the guards put their lives at risk to protect what their fellow Congolese armed forces are plundering? It is too sad to bear. James Biangbale and Kambale Bemu – 23 December 2010 in the Okapi Wildlife Reserve. It is not only park guards who stand up against armed men; it is unarmed citizens as well. 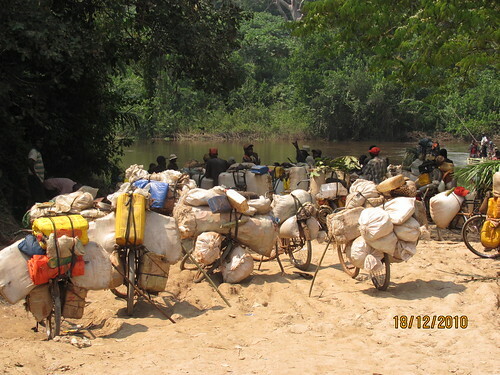 On the borders of the Bili Uele Reserve: Chief Kpilimbalo refused to cooperate with undisciplined elements of the Congolese armed forces who were intent on poaching elephants in his village’s forest. After reporting them to the authorities, he received death threats and fled with his entire village into the forest. Remote Bili Uele recieves no 4 wheel traffic. Even the most essential goods come in two wheel caravans. Chief Kpilimbalo’s courage gives hope. In fact all the remaining Abraham prizes show the grit and village level commitment that continues to hold-out for nature in DR Congo. The Abraham ceremony gathered eight of these heroes together in Kinshasa, together with diplomats, politicians, and conservationists. Thus their determination was honored and we, the audience, were reminded of what our priorities must be. The German Ambassador and the wife of the American Ambassador are attentive. It is a full-house at the Abraham Ceremony 2011. Along with Chief Kpilimbalo, there were two other traditional leaders who did what ICCN (Congolese parks authority) and international conservation organizations cannot do; they rallied a doubtful and divided population to the cause of conservation. 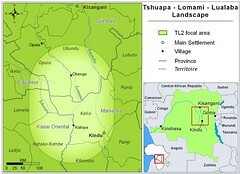 Ramazani Okota –convinced all the village chiefs in a critical zone to support the future Lomami National Park. 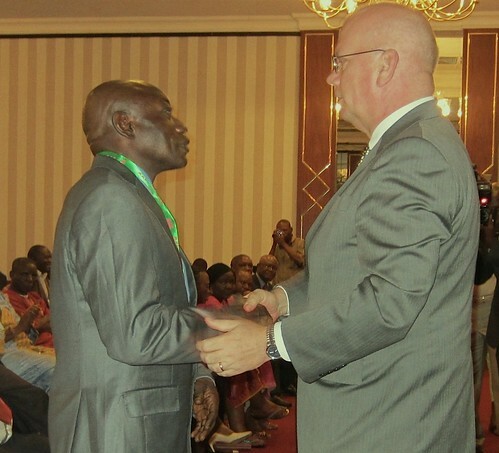 The American Ambassador gives Chief Ramazani his award. Particularly reassuring was the officer from the Congolese Armed Forces, who reminds us that even where institutions are weak, individual responsibility can make a huge difference. Major Guy Kolongo was honored not only for arresting poachers and for disciplining far-flung troops, but also for working close to the ground. He snuffed out the rogue ambitions of those who commandeered the environment for individual profit: a politicking “prophet”, an army lieutenant and an escaped convict. Major Guy is unequivocal about right and wrong. Although the Abraham Foundation recognizes the courage of people who, otherwise, have no voice, in the case of the Minister of Agriculture, Norbert Kantitima, an important exception was made. He is now in President Joseph Kabila’s cabinet and pushing for fundamental development of his country, but he was involved in one incident, little talked about and that is only now finding resolution. It was during the war, in the year 2000, when Norbert was governor of South Kivu. 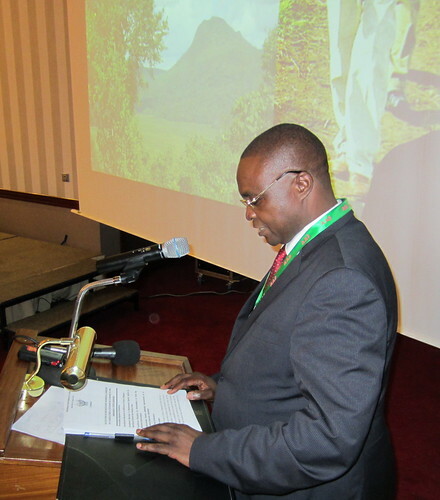 Motivated by his childhood love for Kahuzi Biega National Park, he cancelled all war-time concessions in the narrow, but critical Nindja connecting corridor. He sent a mixed group of villagers and ICCN to mark the park limits. They were attacked pre-dawn; ten people were killed. Now, as the ICCN is again reclaiming the corridor, the Minister called the Nindja chief, who had been present at the massacre, to receive the prize by his side. Minister Kantitima shared the trauma of the war in Kahuzi Biega National Park, calling up local chiefs as witnesses and solidarity for the future. Boketshi Bunda is a park guard in Salonga National park valued for the quickness and accuracy with which he mastered research skills. Despite this he has insisted on maintaining his basic patrol role even after spending several months in jail, wrongfully accused by poachers. 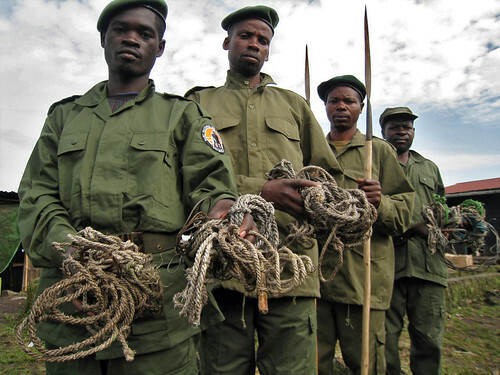 Park guards from Virunga National Park with the large-mammal snare lines brought back from a patrol. This entry was written by Terese Hart, posted on 2011-10-19 at 2:57 pm, filed under Kinshasa, Law and Order. Bookmark the permalink. Follow any comments here with the RSS feed for this post. Post a comment or leave a trackback: Trackback URL. Congratulations Chief Kpilimbalo … thank you for standing up to these criminals! Thank you Terese for your help in organising the Abraham awards. The fallen rangers deserve all the recognition both in the Congo and internationally as well. Powerful post. Incredible selflessness. Thank you to each one for trying to preserve the DRC’s unique fauna. RIP guards Muhindo, Mastaki, Kambale, and James, and all others who bravely did their jobs to protect people and wildlife. Thanks to them and thanks to all other people, armed or unarmed that bravely stand up for what’s right.